Thanks everybody, this helps a lot. Last edited by WyattKPauls on Fri Mar 14, 2014 11:06 pm, edited 1 time in total. I don't know where you live in Oregon but your time would be well spent to visit Brad Angus. He makes great pipes and lives in Vancouver Washington right near Portland. If you do a google search of his name all the contact information will be there. Quick, Brad! Run while you can! My name is Randy and I have owned three practice sets. You need to learn to play before you make them so you know what a good set is. Each maker has good things and bad things and I can discuss my experiences offline with you if you want to contact me. One can spend so much time researching how to make pipes and money buying equipment just to find that they don't do well learning how to play them. Leo Rowsome was not a great teacher, player, maker, as one subject alone, but he was the best at all three because he would make the instruments for his students so if they were having trouble, whether it be leaks, a hard reed, a bore that needed adjusting, or just a player that needed to be kicked in the pants, he controlled both his product and his patrons. So many pipe makers get a bad rap because the players live some distance away and the maker cannot physically walk the player through problems or teach them how to play. Having said that, all is not lost, but rather than go through three sets of pipes like I did, I would recommend that part of learning the pipes is to find a maker who is willing to host you when you need to fly out now and then and that you be willing to spend the money on travel. You will spend $6000 and 10 years when you are done assembling your instrument. Certainly a flight to pick up your instrument, one or two times afterward to answer the question about "is it me or my instrument" should be a part of your plan. 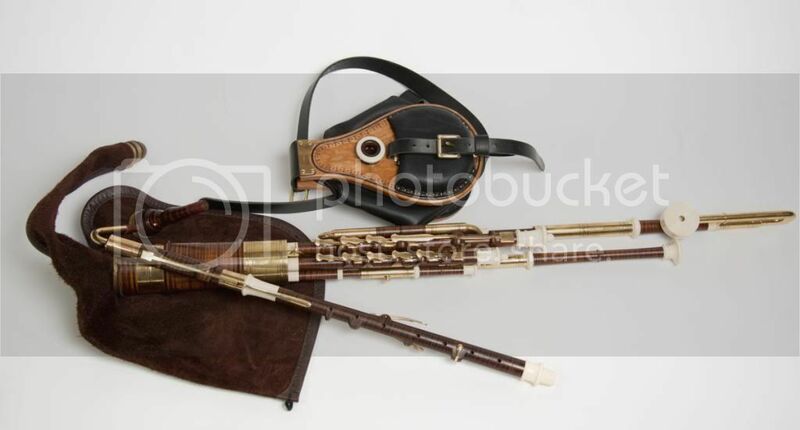 I have friends who have instruments they had made by makers in Dublin and Wales as well as here in the states, who play for a while then quit because it's "too hard" when really a $1000 trip to a pipe maker could fix the problem! If you buy in the states the cost of a trip might only be $200. I know of several makers that would put you up for the night. Eliot Grasso in Springfield is a great resource. His business is teaching so a $50 an hour class will be an investment but my Clarinet teacher charges $75. Eliot can recommend a good set but talk to me about my experience with his maker first. There have been some changes. Also, I know of online software that you must have and it's free. You should also invest in the stuff to make reeds. Cane changes shape and function. My pipes were made in the Midwest and the only way I can get a good reed is to make it here in Oregon. I asked Paddy Malone how many reeds he carries with him on trips and he told me that he has a box of them. He has his New York Reed, His California Reed, His Dublin reed....Etc. Again, talk to me. The main point is, if you decide to take up pipes, you need to commit or don't do it at all. I don't play well myself but I work in Wilsonville and would love to learn with you at least once a week in Portland if you want to host. I live in Salem and can host you at my Victorian Estate as well. My ballroom has great acoustics. Wow so it's now been a long time since I've been on this forum. I've talked to Chris Bayley a couple times now, once about two years ago and once again recently. I'm looking to buy a practice set and move up from there. I enjoy having new instruments added to my studio for recordings, and I just have a few questions to ask if anyone sees this. I don't play any woodwind instruments exept the flute and whistle. I started reading again and it looks like I'll need to learn maintainance and reedmaking skills for the Uilleann Pipes to keep them in shape. Maple is a wood I would normally would not use for my pipes due to its softness, porosity. I have made the odd set from laburnum, fruitwoods and wild service but prefer Box, Ebony, ABW, Palo Santo, Cocobolo etc. The advice I would give to a newcomer to the pipes is to get along to a pipers club, Tional or a local maker so you have a real appreciation of what you are taking on. since you are in oregon, stick with a US maker and avoid the hassle/cost of shipping internationally. You are also mmuch more likely to run intor your pipemaker at a Tionol. Quality of the website has absolutely nothing to do with quality of the pipes. Pick up a phone and call some US pipemakers. I'm pretty sure Joe Kennedy will be surprised to learn he is suddenly a US pipemaker. If you're in Oregon, Brad Angus is on your doorstep, relatively speaking.